More and more companies are turning to robotics for efficiency, repeatability and quality. Robotic painting provides distinct advantages, especially for just-in-time (JIT) suppliers who make frequent product or color changes in order to keep up with production demands. Say, for example, you are someone who supplies automotive door handles. You are probably painting blue ones, black ones, green ones and other colors. You are likely painting them in batches every week, maybe two or three times a week each, in order to meet delivery requirements to your OEM client. Consistency in such situations is critical. What gets painted on Thursday must match what was painted on Monday. That’s where industrial painting robots provide an advantage. Robotic systems ensure efficient, repeatable quality in conditions where frequent changeovers are required and rework is unacceptable. With robotic systems, you can run the same program on the same substrate time after time, with the same results, in order to support your JIT deliveries. The same need for predictable efficiency, especially with smaller parts and repeated batches, is happening elsewhere, too. Beyond automotive Tier I applications, robotic painting is making inroads in other diverse industries. From bicycles and furniture, to cookware and medical devices, paint robots are making their mark. As the need for predictable quality migrates through the manufacturing industry, the painting world's response to it is to add repeatable processes. They turn to robotics. On a larger scale, commercial jet airliners are embracing robotic painting, too. OEMs who are looking to increase quality and lower costs are using robots to paint entire wing assemblies. The industry is truly taking off. Other factors driving the adoption of paint robots include desires for waste reduction, lower energy consumption, shorter cycle times, smaller footprints, lower capital equipment costs and environmental compliance. Environmental compliance is a long-standing consideration in the painting industry, which relies on solvents and chemicals as its life blood. Paint and coating manufacturers are going-green by devising new formulations almost weekly. Chemistry marches forward on its quest to reduce the carbon footprint. The industry is becoming more and more sensitive to environmental considerations by reducing chemical consumption and reducing emissions. Changes to coating formulations can and do impact viscosity. The new formulations respond differently to varying conditions. Painters who spent years perfecting in-house solutions for viscosity issues may find that those old ways do not work as well with the new formulations. As formulations advance, in many cases, they become more sensitive to changes in their environment. These changes often manifest themselves as changes in viscosity, changes in rheology, in how the paint sprays, how it flows out over a part, and how it behaves on horizontal and vertical surfaces. As paint suppliers optimize for environmental compliance, they often sacrifice a wider operating window, which means you need better process controls in order to get the same results time after time. Temperature control systems like the type provided by St. Clair Systems can help stabilize the behavior of these new formulations. 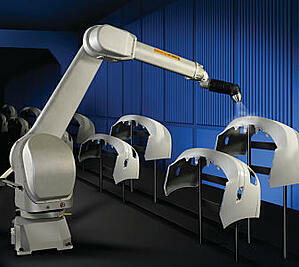 Collaboration between humans and robots has existed in the robotic paint industry for years. For example, an industrial painting facility might have three or four robots in sequence that are painting a part. In the very last cell, a human is standing there with a gun with the same color, doing touch up. This is the original interaction between robots and humans. Collaboration like this has been in place in our industry for years. It's just now making it into assembly and other operations where people and robots are in closer proximity. Even with the many technology changes taking place, there is one constant in industrial painting that robots can’t solve with a simple wave of their automatic arms: temperature variation. Temperature fluctuations are part and parcel of the industry. These fluctuations are often the culprit when it comes to viscosity variations and finish quality issues. And no matter how far robots advance or formulations evolve, there’s always mother nature. As long as the sun continues coming up in the morning and setting in the evening, temperatures will be changing. Seasons change from January to June to December, and so does the temperature. Minimizing those fluctuations with a temperature control system is the key to controlling viscosity and ensuring quality, reliability, predictability, and profitability. If you are curious how a paint temperature control solution can improve results when applying your primer, basecoat, or clearcoat, Saint Clair Systems can provide you with input specific to your application. Contact us for more information.